"Our fathers approve the match." He skimmed a pebble across the fish pond. Alis watched the stone skipping across the water. Her heat-beat skipped like the stone and she prayed she was not blushing. "And you?" She could not recall his name, but how could she not be distracted? She had woken and risen a maid, a spinster intent on learning. Now she was betrothed to this stranger. "I am not displeased, Alis." He offered her his arm to assist her across the ditch - the parents had sent them off to admire the lord's new rabbit warren, to see the baby coneys, as her father had said. Could any symbol be more obvious? In a burst of resentment she ignored her betrothed's hand and jumped the ditch in a swirl of skirts. The rest is free here at AuthorsDen. 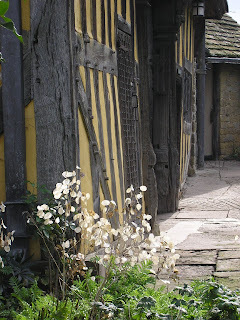 The picture was taken at Stokesay Castle in Shropshire. I love exploring new authors and after your message this morning, couldn't resist popping over. Love the excerpt, and may I link your blog to mine? Absolutely, Anita. Thanks very much! I've added you to the author blog list on mine in return. Wow, Lindsay! I just got here and found this. I should keep more up on things happening. Great story. I love the pic too.